Twin Valley League rivals Valley Heights and Troy will battle for a second time this season with the winner advancing to the 2-1A quarterfinals. The two teams met in the season-opener in Troy with the Trojans winning 58-27. In that earlier meeting, Troy grabbed a 22-8 lead after the first quarter behind a big passing night from quarterback Reid Greaser. Greaser was an efficient 11 of 13 passing for 330 yards and three touchdowns. He connected with Cuttar Huss five times for 183 yards and a pair of touchdowns. Brody Winder also had 114 receiving yards and a score on just three catches. For the season, Greaser has been one of the state’s top passers. Greaser has thrown for 2,242 yards this season after passing for 1,807 yards and 25 touchdowns in earning All-State honors in 2015. Huss has been one of the classifications’ top players for the better part of three seasons. He earned All-State honors a season ago after rushing and receiving for more than 700 yards and a combined 21 touchdowns. On defense, he had nine interceptions. This season, Huss leads the Trojans with 948 receiving yards, while Winder has 818 yards. While Troy is more of a wide-open spread offense, Valley Heights keeps things on the ground. The Mustangs have averaged around 375 yards per game rushing. Hunter Stevenson leads the Mustang’s attack with 1,555 rushing yards and 21 touchdowns. He’s averaged nearly 8.5 yards per carry. Logan Woodyard has added more than 560 rushing yards and 17 touchdowns, while passing for 432 yards and seven scores. Jordan Yungeberg has added more than 800 yards rushing. Last week against Washington County, the Mustangs led 36-30 late before the Tigers scored twice in the final 3:30 to win 42-36 sending Valley Heights back to Troy. In the first meeting, Woodyard rushed for two scores and threw a touchdown pass to Harrison Blaske. 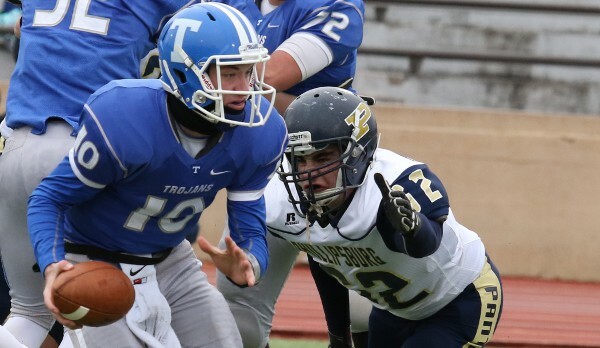 One of Kansas’ premier small school matchups continues after a rare one-year hiatus last fall. La Crosse is 8-3 against Meade since 2004, but the series is 3-3 since Meade won 46-12 in 2009, the first time the Buffs defeated the Leopards in school annals. The game has often yielded a different result than the conventional wisdom entering the contest. In 2008, the teams were matched up in district play and both were undefeated entering Week 9. La Crosse won 51-7. After Meade had blowout victories in ’09-10, La Crosse won 21-12 at Meade in 2011. The Buffs were ranked No. 1 and riding a 22-game winning streak. In 2012, the Leopards were ranked No. 1 and filled with stars, namely Kip Keeley and Levi Morss. No. 2 Meade, paced by current Washburn standout Trevin Wiens, won 34-12 at home. However, in 2013, La Crosse won at Oakley in the final seconds, 12-7, and then defeated Meade, 38-24, at home to reach the state title game. In 2014, the teams were both in the top-5 and considered fairly even with each just having one loss, but La Crosse delivered a 34-0 home victory. This year, Meade has rolled through the easiest schedule in Class 2-1A, according to Prep Power Index, and ranks first in scoring offense (477) and defense (74) in the classification. La Crosse, which had a rare postseason miss last year with a 3-6 record, opened 0-4 before winning four straight contests. The Leopards lost, 46-12, at home to Plainville last week. La Crosse fell 18-12 at playoff qualifier Elkhart in Week 1, while Meade defeated Elkhart, 54-14, in Week 8. The Leopards have struggled against talented running backs, namely Colby’s Jordan Schippers, Washington County’s Hunter Kier, Ellsworth’s Kaden Davis and Plainville’s Riley Nyp. La Crosse has an experienced offensive line that has opened holes for 273 rushing and 104 passing yards a contest. The Leopards average 6.3 yards per play. Senior Clayton Herdman has 156 carries for 901 yards and 13 rushing scores. He has completed 50 of 120 passes for 845 yards with 13 scores against 10 interceptions. La Crosse has 15 turnovers and is minus-1 in turnover margin. The Leopards have blocked four kicks, including three punts. La Crosse has struggled in conversions with just 4 of 10 on point after kicks and 12 of 34 on two-point conversions. Senior Jasey Woods leads the team with 97 tackles. Meade has averaged 306 rushing and 100 passing a game with 8.3 yards per play. Senior Lawson Luetters has completed 42 of 87 passes for 833 yards with 15 scores against seven interceptions. Luetters has 137 carries for 1,117 yards and 22 scores. Senior Blake Keith has 66 carries for 431 yards and 11 rushing touchdowns. He also has 13 catches for 266 yards and four scores. Meade has 12 turnovers and is plus-9 in turnover margin. Meade’s conversions have been much stronger with 26 of 30 on point after kicks and 26 of 33 on two-point conversions. Meade lost 20-14 to an eventual 7-3 Cimarron team in Week 4 but has eight blowout victories. Meade has certainly been stronger this season but both squads are senior-laden with experienced players, including Herdman and Luetters. The game will likely be closer than the team’s statistical profiles entering the contest and don’t be surprised to see La Crosse push Meade late.